The Ferrari Enzo was technically a roadster ... though 'technically' is about as far as it went! Red-blooded racing ran in its veins. The name said it all. Founder of the myth that is 'Maranello', Enzo Ferrari's legacy is secure! 'The Professor', Alain Prost - French F1 legend - once said he did not know why racing drivers do what they do. 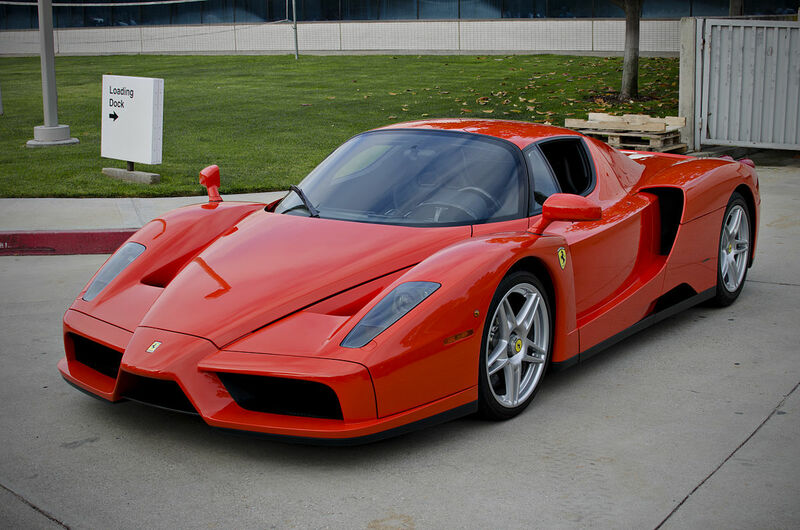 Cars like the Enzo - with its 660bhp power rating - probably provide a few clues! There were striking links between the Enzo and Ferrari's F1 car of the day. Its CFC/Nomex body panels, for example, bear a striking resemblance to those of the GP car. Beneath those panels sat a carbon-fibre monocoque - similar,again, to that of the F1 car. Even the Enzo's V12 engine was cut from the same GP cloth ... well, in terms of layout, at least! Huge venturis modelled 'ground-effect' - the set-up which 'glues' GP cars to the tarmac. And the Enzo was kitted out with 'active aerodynamics' - a system not too far removed from that of top-flight competition cars. Its brake discs were carbon-ceramic composites. Matching all that tech spec, visually, might have been a challenge. Pinanfarina, though, spared Ferrari's blushes. The great Italian design house had long been associated with the 'prancing horse' marque. They fulfilled Ferrari's brief to perfection - supplying carbon-fibre solutions, inside and out. Ferrari had problems, though, when the Enzo went on sale. Not because of any problems with the product. The car was so sought-after - even with its £425,000 price tag - that all 349 Enzos sold out within hours! In an attempt to placate frustrated buyers, Ferrari scaled up to 400. One of the most finely-wrought supercars ever made, the Ferrari 'Enzo' was a fitting tribute to the man who inspired it.